Macquarie University is internationally renowned for excellence in interdisciplinary research and teaching, a unique approach to learning, highly skilled graduates and first-class facilities. Australia's number one modern university, offering internationally recognised and respected degrees. $1 billion investment in facilities and infrastructure ensures access to the best technology and facilities. Eighty-five per cent of Macquarie's research activity is rated as performing at world standard or higher (ERA 2012). Australia's most technologically advanced private hospital on a university campus. Almost a third of Macquarie's students are from outside Australia, with the largest contingent from China, which makes for a diverse and rich campus experience. In 2013, Australia's Good Universities Guide gave Macquarie a five-star rating for the cultural diversity of our student body. What brings students here is our unique approach to learning with an emphasis on interdisciplinary study and turning out highly employable graduates. Our curriculum is built around culturally inclusive and internationally focused learning and teaching. All undergraduates take units to develop their social, cultural and scientific literacy, aimed at encouraging them to become global citizens. Macquarie students also have the advantage of attending university in the heart of Australia's largest high-technology precinct. Because of this location, our degrees offer outstanding integration with industry, providing students with a superior learning environment, enhanced internship opportunities and greater exposure to the job market prior to graduation. 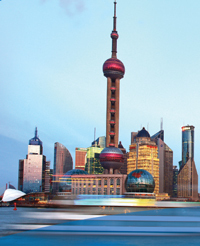 As well as teaching in Sydney, Macquarie teaches its internationally renowned applied finance course in China. For the last eight years, the course has been delivered at Tsinghua University and from 2014 it will also be available from East China Normal University. Another major feature of our relationship with China is the University's cotutelle and joint PhD program. In recent years, we have established strong relationships with leading universities in China to jointly enrol and supervise higher degree research students, supported in many cases by the generosity of the China Scholarship Council. This teaching activity, and the quality of our research, has seen Macquarie ranked as Australia's best modern university and number 18 in the world by the QS Top 50 Under 50 rankings. After graduating with a Master of Economics from Macquarie University in 2007, I obtained a great job at a world-leading Wall Street company famous for its award winning risk management solutions for the hedge fund industry. and funds management business Richlink Capital Pty Ltd. I am deeply grateful for what I have today and what tomorrow will bring. Read more of Michael Guo's story. 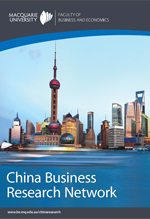 The China Business Research Network (CBRN) is a research cluster within the Department of Marketing and Management that aims to consolidate China focused research in the areas of demography, human resource management, international business, and marketing. The CBRN is designed to contribute to the significant and unique research taking place on various aspects of China's commercial, consumer and societal developments. The CBRN staff welcome PhD applications to work on the projects in the current areas of research and expertise. Last Updated: 2015-03-05 13:17:00 by Unknown.